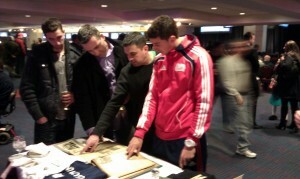 Revolution midfielder Andrew Sousa takes a look at some of the exhibits. We would like to thank everyone who came to our table at tonight’s Revolution Season Ticket Holder event at Gillette Stadium. It was an honor for us to see and talk with so many different people of all ages about soccer’s rich tradition right here in our own backyard. We look forward to seeing and hearing from you again! Members of the Hall will be setting up a NESHOF booth at the New England Revolution Season Ticket Holder event on Monday, March 28th at 6:00pm. We will have a small display of jerseys, books, newspaper clippings and photos available. Hope to see you there! It is with great sadness that we report the passing of New England Soccer Hall of Fame 2009 inductee Denis Chartier. 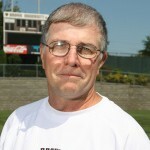 Coach Chartier, who coached the women’s soccer teams at Rhode Island College and Brown University, was one of the most widely-respected coaches in Rhode Island. His untimely death is a tremendous loss for the entire New England soccer community. You are currently browsing the New England Soccer Hall of Fame blog archives for March, 2011.